British Blind Sport is pleased to confirm the 2019 date for the charity’s annual National Youth Swimming Gala as Saturday 30th March. Register here! 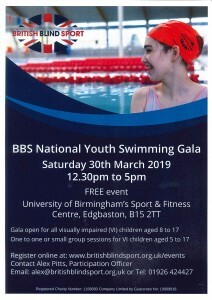 Hosted by British Blind Sport, this event has been held successfully for over 20 years and is the only VI specific youth swimming competition in the UK, attracting participants from across the country. Open to all abilities, whether you are a beginner or competitive swimmer, come and have a go! Free entry for all blind and partially sighted children aged between 8 to 17 years old. Free, one to one and small group lessons will also be on offer for those children aged 5-17 years of age, who may not feel confident enough to take part in the swimming gala but would like to learn the basic principles of how to swim.